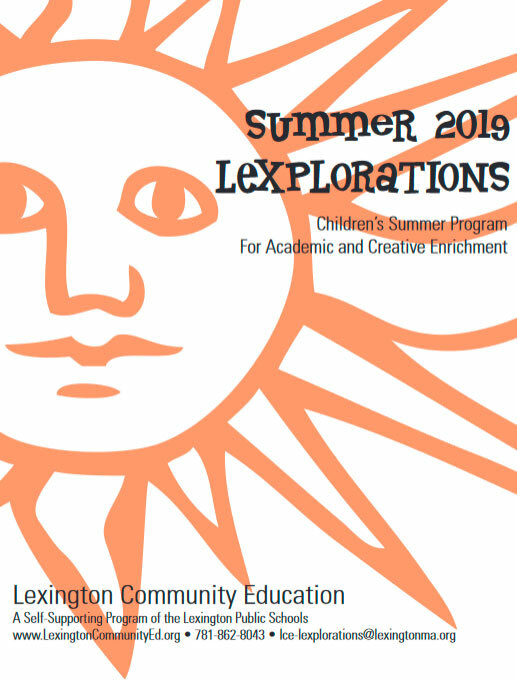 Online: Visit our website at lexingtoncommunityed.org to register using a Visa or MasterCard. By Mail: Use the registration form on the back page of the print catalog. Complete the General Release and Waiver of Liability form and enclose a check made payable to: Lexington Community Education or provide your Visa or Mastercard number on the form. Walk-In: Before June 27th: The LCE/Lexplorations office, located at 146 Maple Street is open from 9-3, Monday through Friday. Our Lexington High School Office is open from 4pm-9pm Monday through Thursday while classes are in session. After June 27th: The LCE/Lexplorations office is located at the Estabrook school in room 101. By FAX: Completed registration forms may be faxed to the LCE office at 781.863.5829.
and Lexington High School (251 Waltham Street). Lexplorations programs meet from 9:00 am to 3:00 pm unless noted. Children should not be dropped off without an adult prior to 9:00 am. You must pick up children promptly at 3:00 pm. A late fee of $1.00 per minute will be charged for students remaining at the school past 3:10 pm. Class size is generally limited to 12–15 students, depending on the age group. Most classes have a minimum enrollment of 6 students. We will notify you if your child’s program must be canceled due to low enrollment. Students in canceled classes often find other Lexplorations programs of interest in which to enroll. If a program is filled, you can request that your child be added to a wait list. Programs that repeat are the same in content unless specifically noted in the description. All materials fees are covered by tuition costs. There are no additional materials fees. The Lexplorations nurse is stationed at Estabrook but is available by phone and “on-call” for programs at LHS. The nurse’s hours are from 9:00 am until 3:00 pm, Monday-Friday. Please Note: There is no nurse on duty during the before school or after-school program. All information regarding a child’s allergy (ies) provided to Lexplorations will be shared with the classroom teacher and Lexplorations nurse. Please pack a daily snack, drinks and lunch for your child. There are no refrigerators in the classrooms. Please pack an ice pack if necessary. Please apply adequate sunscreen for your child each morning. All money is returned if LCE cancels a class. A $15 Switch Fee will be charged for each change to a child’s registration. If you withdraw from a program at least 10 days prior to the start date, tuition will be refunded minus the $30 per class processing fee. If you withdraw from a program less than 10 days prior to the start date, all tuition will be forfeited. Limited scholarship assistance (up to a 50% reduction/$500 family maximum) is available for Lexington residents. Please call for details.